It’s been hotter than getout lately here in the Beehive State. If you’re drinking Petite Syrah and jammy Zinfandel, more power to you... drink what you like. But for our part here at Utah Grape & Grain HQ we’ve switched over to more refreshing fare as we endure this heatwave. Even though we’re just as excited about a particular Albariño brought in by Terrestoria (listen to episode #2! ), this month’s product spotlight is focused on pink wine. Since we here at Utah Grape & Grain like to dig into the stories behind the products, we picked out a few wines that break rules. Either in their disregard for "normal" varietals or in their exacting farming and enological techniques, all three wines below are unique when it comes to Rosé. Without further ado, here are a few Rosés that you need to sniff. And put in your mouth. From the winemaker, Sam Bilbro: "Flora and Fauna loosely means the collection of plant and animal life of a certain epoch. In my version, it is the collection of varietals from the cellar that make up the blend for the year. For 2017, The Flower is a co-fermented blend of roughly 47% Nebbiolo, 28% Barbera, and 25% Dolcetto. While the wine is designated as Mendocino County, the majority of the fruit in fact comes from the Fox Hill Vinyard. Located southeast of Ukiah on Mendocino’s Talmage Bench, the soils are well drained with high concentrations of gravel and sandstone. For the Rosé, which is picked and specifically made for this wine rather than as a by-product of a red wine, I chose the most shaded sections and areas with higher concentrations of clay." To say the least, it is an unconventional idea for Nebbiolo, Dolcetto and Barbera to be co-fermented for a Rosé. It should be noted that these grapes ripen at very different times. But in this case they were all picked together at the moment when their different qualities and stages of ripeness came together and were complimentary. In the winery, the grapes were whole cluster pressed, fermented via native yeast, left on all the lees and solids, aged in neutral oak, and underwent native secondary fermentation. Complexity and texture are gained from allowing secondary fermentation and aging on lees in neutral oak for four months, while the structure and acidity from picking plenty early allow for great vibrancy and energy throughout the wine. Our take: I can’t hide my affection for this wine… it is my favorite thing to drink right now. I get all sorts of things that nobody else gets when they smell The Flower - yes, there are flowers and citrus. But, when I stick my nose in this juice, I also get petrol and caramelized sugar. It’s like bananas foster but made with gasoline instead of rum. And it’s magical. Perhaps you’re a Rosé skeptic. The Flower is a good place to branch out. We are drinking it with funky cowsmilk cheeses, by itself or with deserts made from fossil fuels and tropical fruit. We’re not going to spend three hours talking to Evan over at Ruth Lewandowski and not tell you that his Rosé should be on your list if you’re in Utah, are we? Nay. Because we have an entire episode focused on winemaker Evan Lewandowski’s story, we’ll make this plug brief. For 2017 the Ruth Lewandowski Rosé is made from Souzão (65%) and Touriga Nacional (35%) grapes. That’s right - while his buddy Sam (made famous in the paragraphs above) is doing wildly successful Rosé things with Piedmont grapes, Evan is taking fruit historically grown in Portugal and doing his own thing. If you want to go for a really fun ride, try the Ruth and the Idlewild options next to each other. Shared vineyards, shared winemaking ideas and values, super different grapes, totally unique outcomes. Evan made 160 cases of this stuff and you can still find it, for the moment, by the glass at some of the Scott Evans restaurants like Finca and Pago. You can also get on the Ruth Lewandowski email list so that you’ve got a shot at purchasing Evan’s wines upon their release. From the winemaker, Steve Matthiasson: "Our 2017 Rosé was made from a combination of Grenache, Syrah, Mouvèdre, and Counoise from the Windmill vineyard in the Dunnigan Hills, Syrah grapes from the Hurley Vineyard in Napa Valley, and Grenache grapes from the Gibson Ranch in the McDowell Valley of Mendocino. It’s citrusy aromas and clean flavors will complement the wonderful spring foods that show up on the table as the weather thaws (salads, rabbit, frittatas, peas, favas, green garlic…). Perfect for springtime holiday meals, or enjoying on the porch all summer." Our Take: Finally, something to pair with all of that rabbit you’ve been eating this summer! Steve Matthiasson is a sort of rockstar in the California winemaking world. One could argue that his rule breaking paved the way for guys like Sam and Evan to continue pushing the boundaries of what California wine can be - particularly when it comes which grapes to grow and how to grow them. Steve and Jill produce fruit, with heavy emphasis on sustainable farming practices, that will turn into wines designed to compliment their favorite foods. While everyone else grows Chardonnay in Napa, the Matthiasons are experimenting with Fruilano. And they are the poster children for making wine in the vineyard - just look at their website and see how many words are devoted to describing the individual vineyards vs. the wines. Site, place, terroir - these are the first priorities for Matthiasson. And the value! Francis Fecteau, Steve's Utah broker, says "60 year old gobelet Syrah in a Rosé?!? It's a dead ringer for anything out of Provence or Rhone at half the price". We concur. This is one of those times when you should feel pretty damn good about living in Utah, because the rest of the world is paying more than we are for Steve Matthiasson’s genius wines. We get this juice for 20 bucks. 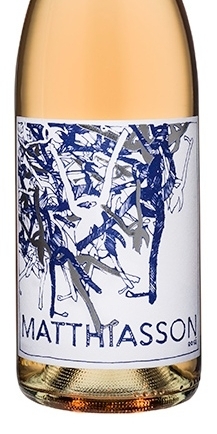 I’m drinking Matthiasson Rosé as I type, and it pairs up beautifully with Prosciutto San Daniele, although it’s pretty versatile and stands up just fine by itself. There you go you heat-exausted Utah wine drinkers - hopefully you'll have a chance to try a few of these out. We'd love to know what you think. Until next time, if you want more insight into what we're sipping, check out our instagram account.